Chessdom: Hello Magnus, thank you for accepting the interview. You already have one participation in Morelia/Linares super tournament. What are your impressions from the last year’s event and generally about Mexico? Magnus Carlsen: Last year the fact that I was invited to Morelia/Linares was a huge success in itself, and I did not have any special expectations. Winning 3 out of the 5 first games was a bit unreal, and of course the great overall result strengthened my perception of Morelia/Linares as a great tournament in all respects. I like Mexico, and especially the people and the food. The respect and appreciation received from spectators and fans during the tournament last year was also something very special. Chessdom: Games in Morelia are starting at 22:30 Central European Time. There will be many sleepless people in Norway who will stay to watch live transmission. At the same time, almost all important newspaper in your country have established regular chess columns thanks to your successes. Do you feel this to be pressure? Or is it more of a motivation? Magnus Carlsen: I’m not really sure there are new chess columns in Norwegian newspapers because of me, but I do appreciate that they cover the tournaments in which I participate regularly. I tend to focus more on my own expectations. I’m not so concerned about what other people expect, although I appreciate the enthusiasm and support received from the Norwegian chess community. Chessdom: Mr. Mamedyarov said that he had to decline Morelia/Linares invitation because of the tight tournament schedule, but he also mentioned negative effect of long distant flights. What is your experience with frequent and long distant travel, time zone change and accommodation? Changing accommodation is not a big problem as hotel standards generally are very high at elite tournaments. Chessdom: What is your tournament schedule in the following months? Have you decided in which four of the Grand Prix events you will take participation? 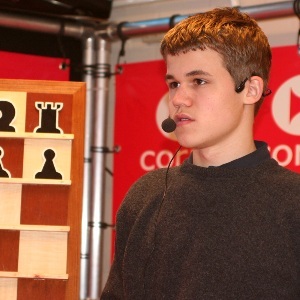 Magnus Carlsen: I will play the Amber Rapid & Blindfold tournament. The 2nd and 3rd quarter program is not certain yet. We’ll know more in a couple of weeks from now. Regarding GP, I think it is more appropriate to respond to FIDE before addressing this in public. Chessdom: We know you like to play football and table tennis. What are your other leisure activities? Magnus Carlsen: I like to spend time with friends, go to movies, I read alot, and occasionally I do some other sports like tennis or skiing. Outside chess I think I’m a fairly normal teenager. Chessdom: Thank you and enjoy your stay in Mexico and Spain. 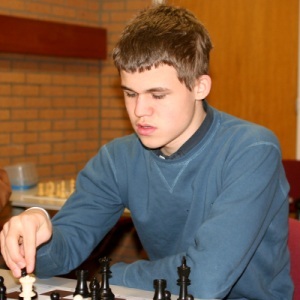 Magnus Carlsen: Thank you, I will!